Erin's name was sent my way on a couple of occasions, but I can officially give Amanda Stuermer the credit for connecting us for this interview. And then again, just after Amanda's referral, I met Erin briefly at a Community Conversations event. So, without reading too much into it, it seemed like we were meant to meet. And it might not have as much significance to him, but this being interview number 100 means quite a lot to me. Erin is so obviously doing heartfelt work and so articulate about it. Whenever I meet someone who seems to be living in line with their values, it warms my heart and encourages me. We don't always get to know the effect we have on folks, especially as we go about some of the more mundane details of our daily routines, but people are watching and taking note and we are having an effect. I'd like to say thank you to Erin for the positive impact he made on me and likely whoever takes the time to read or listen below. Well, I'd say like most humans, I'm complex and nuanced in a lot of different things. But among other things, maybe most obviously, I'm a white man. But I'm also a member of the LGBTQ community. I'm a member of the Baha’i Faith. I'm a survivor of intimate partner violence. A number of other maybe personal identities in that way, but I also identify strongly as an advocate in a variety of contexts. 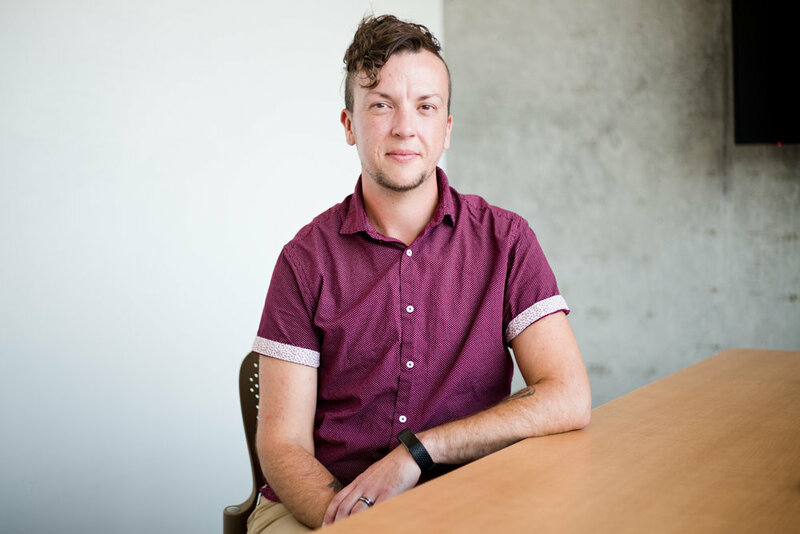 I am active volunteering with the Human Dignity Coalition and promoting LGBTQ equality in that sense, but also in my professional life as the Diversity Coordinator at OSU Cascades. Advocacy plays a strong role in that job as well. I guess I see myself as someone who is always looking for ways to help people out or to support them or help make connections - things like that. Even though I'm not currently working as a journalist, I see being a journalist as kind of a part of my identity - I think that the values and principles that come with that field still really resonate for me and I think inform the way I approach other work. And I guess I would say, otherwise, in terms of how I describe myself, I'm an introvert whose work and passions require me to behave as an extrovert and so that's always a fun challenge. And then the other thing that comes to mind - when I was younger, I used to describe myself as kind of being an English to English translator. It's not the most graceful way to describe it, but I think I often see myself in a role of trying to help people understand each other in some way or another. That, I think, has kind of informed a lot of the work that I've done. Whether it was as a journalist - I mean, I think in that role, certainly, a big part of your job is to take information that's maybe complex or confusing or just a lot and to condense that and distill that down so the public can understand that as well to help people on different sides of an issue kind of see where the other is coming from. So, I think that's played a lot into my journalism work, but also I worked at Saving Grace for a few years. And I think a big part of that, too, in my sense, was helping the community understand this really vital issue and what it has to do with them and how they can have some impact on it. And then, certainly in my role here, a lot of it's just helping people understand where other people are coming from and trying to explain concepts in ways that meet people where they're at. I think what matters to me and kind of what motivates the work that I do is, as cheesy as it might sound, just to be of service to others. That's a value that I think my parents taught me from a young age and something that's always stuck with me and where I feel like I'm having impact and I can help make things better for people. So, always trying to find ways to kind of root for the underdog or think about who's not at the table and should be, or how can we make something more accessible - you know, make sure we're serving everyone. Just trying to think about how to make things better, but I think beyond that, I'm often kind of zooming out and zooming in. There's this idea... that some folks are maybe more comfortable zoomed out and others more comfortable zoomed in and I feel like I kind of bounce back and forth between those things because, to me, it seems like if you are wanting to be of service to others, part of that is about the interpersonal - that one on one, understanding where they're at, what are their particular needs, where are they coming from. But then another piece of that is really systemic. And so I'm really interested in both those levels, I guess. So, thinking about how can I have a positive impact on people in that interpersonal, day-to-day kind of way, but also how can I impact systems that determine how people's lives kind of flow and how well they go? To try and create change that's gonna have maybe a more lasting impact - that's kinda my primary motivation for most of what I do. What concerns me or gives me a heavy heart in a broad sense is when I perceive that two or two groups really have a shared interest, value, whatever, but they're butting heads - when it feels like there's a conflict that doesn't need to exist, right, something that's only there because of miscommunication or misunderstanding. That can be really frustrating to see the really negative impacts that kind of difference of perception can have. And just the extent to which people are willing to be hateful and unkind and cruel - that gives me a heavy heart, right? Things like recognizing that about 40% of all homeless youth are LGBTQ and that largely that's because their families have kicked them out of their homes or made their homes a place that's not safe to live - to be themselves. Kind of being confronted with that ugliness that humanity is capable of in ways that... yeah, I just don't get it... when it's your own family or your own community. So, that certainly gives me that sense of heaviness, but I think a particular level of frustration when it seems so unnecessary. Not that any of it's ever necessary, right, but when there's conflicts that come out of just poor communication or a failure to really engage in a meaningful way or out of straight ignorance 'cause people aren't willing to learn, I find that really hard. And then, in general, just having to see the impacts this stuff has on people of oppression and marginalization and discrimination. But I think part of how I deal with that is the other side of the coin - is feeling like, Okay, what am I gonna do about that? There's bad stuff in the world - there's negativity, whatever - but what can I do concretely to try to make a positive impact? What do we mean to each other, person to person? I don't usually speak in religiousy-type terms because I'm not a super religiousy person, but I do think that... from my faith background there's this teaching that work done in the spirit of service is a form of worship and that has always really resonated with me. Because I think that when we act in service to one another, part of that's about recognizing kind of the divinity or the sacredness or the commonality - whatever you want to call it - universal consciousness or however you want to conceptualize that. But I think that's about recognizing that in that other person. In my mind, we're all connected whether we see that or not. And so when we cause harm to others, we're causing harm to ourselves. So, I think that, yeah, we have to react to others in ways that we would want others to respond to us. Or, I suppose, if you want pull out the Platinum Rule instead of the Golden Rule, how do other people want to be treated? And we should treat them in that way. So, I think we're here to support each other's growth and, yeah, to the extent that we can focus on that instead of tearing each other down, I think it builds us all up. I don't know if that actually answers your question or not. What does it mean to you to be a part of community? Community, to me, is about people recognizing their shared experiences and shared values or principles and drawing kind of strength and companionship, on some level, from that. I'm a part of many different communities, but to me one of the great things about going back to community is that feeling of being at home and being understood and accepted even when there isn't understanding. The sense of like, Well, you're part of our community and so even if we don't always see eye to eye or don't always understand where each other's coming from, we still value each other. And we're still gonna try to understand. But I think, yeah, community can look like a lot of different things. There's a lot of different overlapping circles, right? And certainly geographic is one way that that manifests, but the LGBTQ community is a community I'm a part of; the academic community; the activist/advocate community; I'm part of communities online that span across the globe. I think it's helpful for us to have multiple kinds of communities that we engage with, but certainly in an ideal world the physical communities that we live in would also feel like those kind of more chosen communities, if that makes sense. I have been struggling to find succinct language for this question, but the topic is social injustice and human rights or a lack thereof or a taking away of them. This underlying hyper focus on our differences and the creation of systems that keep us separate is confusing. What are we meant to do about it? People are working on the different forms of it separately. Do you have thoughts on what might connect all of those? Well, that's a good question and it's something that I think about fairly often since a lot of the work that I do involves diversity and equity and social justice and all this kind of stuff. And I do find that we often will be in spaces talking about a very specific manifestation of social injustice. I think you need both things. I think we do need to have times where we're focusing on the really specific example, right, because there's different factors that play in - there's certainly commonalities, systemically, that factor into all these kinds of oppression, but they're all unique in a way. I think different people find it easier to enter into conversations about different elements - of diversity, or discrimination - but I do think that it would be great if we could have more conversations that tie those things together. And partly because I think some people have an easier time entering the conversation from different angles, right? So, for example, a lot of white folks have a hard time hearing that they have white privilege. And that's understandable, particularly if someone's coming from a background that doesn't feel very privileged, right? Maybe you grew up in poverty or you've dealt with chronic illness all your life or whatever the case may be. But if part of that conversation also addresses sexism or classism or other forms of systemic oppression, then that person might have an easier time understanding, Oh, well I experience it in this way. Now I can see how someone else experiences it in this other way and how, in that case, I'm on the other side of the line. I think we do need to connect the dots more than we sometimes do. I think the first question you asked is a big question, What do we do about that? (Laughs) No pressure, solve all the problems today. But I do think in addition to kind of linking those things together a little bit more so that people can see the multi-faceted sides of this thing, having that human element in there as much as we can... there have been studies that show that just having a conversation with someone or knowing someone from a particular group makes you much, much more likely to support them having equal rights. If you don't know someone in X, Y, Z category, you're much less inclined to care about how they're walking through the world, right? So I think we need to learn how to have conversations across those differences in a way that's safe for everyone involved. Because those can feel risky, regardless of where you're coming from, in different ways. If you're coming from a marginalized background it feels really risky to be vulnerable to open yourself up to sharing with someone who may then just shut you down or cause you harm in some way. But if you're coming from a position of being kind of in a dominant group in society, then that can feel threatening for other reasons, right? So I think the more we can learn to have just human conversations across those differences and to separate out this idea that racism and sexism and all these bad isms are caused by bad people... like we have this idea that racists are all wearing swastikas - just the worst manifestation we can think of - when the reality is we all are complicit in these systems every day. I'm a little bit racist; you're a little bit racist; probably anyone reading this is a little bit... you know, that's just the reality. But because we attach that so strongly to someone's goodness as a person, it makes it really hard for us to be able to see the ways in which we're complicit in those systems because if that means saying, I'm a bad person - like, who wants to do that? No one wants to say, Oh, let me engage in this difficult material and think about what a terrible person I am. (Laughs) We just have to realize that that's the water we swim in - the air we breathe - and we can't put on some kind of biohazard suit and keep it all out, so we have to face it and deal with it. So I think a willingness to have those kind of honest conversations with ourselves and to not make it this really black/white, good/bad thing would make a difference. But I do think we have to talk about the particulars and to borrow a phrase that I can't remember where I heard it, but probably in some social justice training context, there's this idea of making the invisible visible. Because most people don't really see the larger structures that influence these dynamics. They think, Well, I'm not being a racist. I'm not committing an act of terribleness against this person. So I'm good, right? But there are these larger systems that have been in place for thousands of years and continue to just kinda support themselves and so I think helping people see those and see the ways in which we've all kinda just been brought along by that, whether we wanted to be or not. I want to think that's helpful, at least. I don't know. We just have to see each other as humans and not be so attached to kinda the privilege that we have that we have not done anything to earn. You know? Gosh, I hope so (laughs). Yeah. That's something that feels strong to me. I think it goes back to that being in service to others. But beyond that, too, I think I do feel sense of purpose around trying to use my voice to I guess speak up for folks that may not have that voice or feel safe using it. To that extent, I try to be pretty open and vulnerable and honest about my own life experiences because I realize that not everyone's in a position to do that safely. And because I do know that making that personal connection, knowing someone who has X, Y, Z life experience makes a big difference. But it could be literally dangerous for some people to share those things about their lives. So I think those two threads go together for me, right? That being willing to be open and honest and authentic with people with the intention of this kind of larger goal of service. If that makes sense. To me, purpose is why you get up in the morning and do whatever it is you do. It's just about making the world a better place, making yourself a better person. But it doesn't have to necessarily be a grandiose thing. I think someone's sense of purpose could just be being a good friend or being a good parent or having the most beautiful garden in the neighborhood (laughs). I don't know. There's a lot of ways that could play out for people. Time (laughs). That's the fast answer, but it's probably true in some way. It just seems like there are so many things to be engaged in, which is a good thing. There's a lot going on in our community right now - a lot of really interesting work particularly around diversity, equity, and inclusion, and social justice, and having conversations across difference. The silly practical answer is time. I think otherwise, just more opportunities to connect with people who are doing interesting things and who have life experiences that I haven't connected with before. Yeah, more time; more opportunities to have the conversations that I want to have; to do the projects that I'd like to be engaged in. I think, generally, I have a lot of the things in my life that I'd like to have. I'm pretty content. There's not a lot missing in that sense, but it never feels like there's enough time to do all the things that I'd like to do. I don't think so. I'm just glad to see more conversation-based projects. I mean, we're having a conversation, right, but it's also a conversation between the community and the people that you're profiling and the more that we can share our humanity with each other in vulnerable and relatively safe ways, I think that's a good thing. And I'm looking forward to seeing where that takes our community. What inspired you to take on this kind of a project? Or has there been a big takeaway or a lesson or something you've gleaned from doing this kind of work? I mentioned to you before, this is kind of the second project with some similarities that I've undertaken. The takeaway or what I've learned is in progress, for sure. The why is difficult for me to explain. I think it's difficult for me to understand. I don't know that I can be positive that it's my purpose. Like we talked about, I don't know what all that implies, but it's definitely a compulsion; I'm curious about people. I'm curious about who the groundskeeper is or who's making this noise outside with the generator and washing the sidewalk and who cuts me off in traffic. What's on their mind? And was it intentional? And how do they feel about doing it if it was? The big thing for this project, I'm curious about finding a way to soften - me, too, but all of us - in the way we function in the world. It all feels very harsh. And then I'm also reminded daily of the ways that I'm harsh and the ways that I don't live up to my own set of ideals and morals and values and how difficult it is to stay on top of constant kindness. So I guess I can't honestly say this is what came through my mind when this project idea kind of came across my brain, right? But these are all things that I have been thinking about for a long time and this is a way I can explore some of it. I think connecting with more and more people and finding more and more in common with each person seems to be the only way that I've figured out how to have a little bit more peace.